← Don’t Expect CarFree Radio this week…You have no one to blame but yourself! 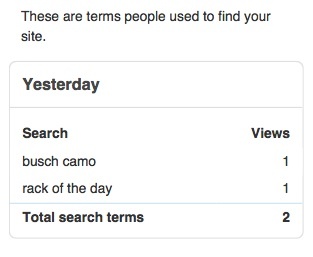 I checked what search terms are getting people to CarFreeBrad.com and couldn’t believe that “Busch Camo” cans are still coming up almost everyday. I do one post about the Busch Camo Cans and I can’t get away from them, but I’m not sure I want to. Might have just decided what I’m drinking for the game tomorrow! This entry was posted in Bike commute, Car Free, Urban Bike and tagged Beer, Busch Camo Cans, Car-free movement, CarFreeBrad.com, Food and Drink Related, Recreation, Super Bowl, Super Bowl advertising, Worcester. Bookmark the permalink.